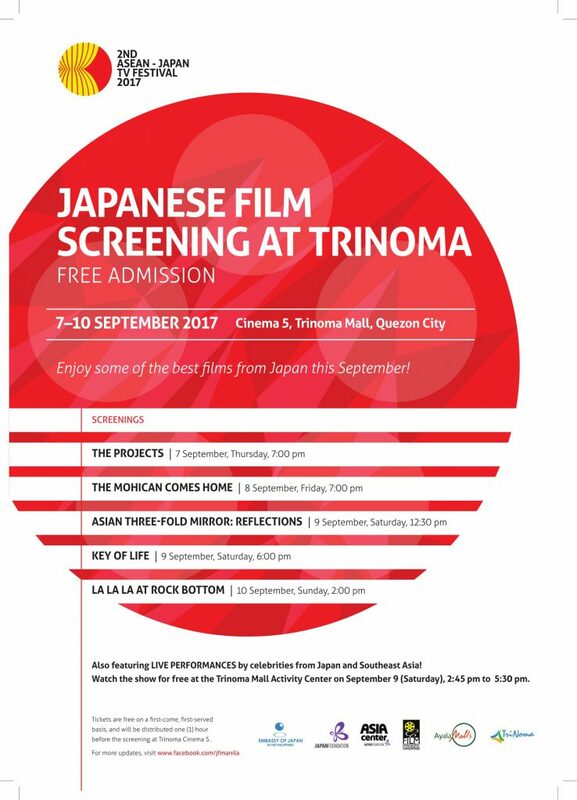 The Japan Foundation, Manila and The Embassy of Japan in the Philippines in cooperation with the Film Development Council of the Philippines are pleased to announce Free Japanese Film Screenings at Trinoma Mall from September 7 to 10, 2017. This event coincides with the 2nd ASEAN – Japan TV Festival 2017 (AJTVF2) to commemorate the 50th Anniversary of ASEAN. Audiences can enjoy five new Japanese films: The Projects (Danchi), The Mohican Comes Home (Mohican Kokyo ni Kaeru), Key of Life (Kagidorobo no Method), and LA LA LA at Rock Bottom (Misono Universe). The line-up also includes Asian Three-Fold Mirror 2016: Reflections which was screened in the Tokyo International Film Festival. 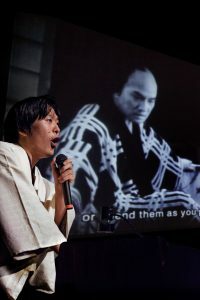 To create the omnibus film Reflections, The Japan Foundation Asia Center joined three directors from the Philippines, Cambodia, and Japan: Brillante Ma Mendoza, Sotho Kulikar, and Isao Yukisada. Films will be shown at Cinema 5, Trinoma Mall, Quezon City. All screenings are free and seats are available on a first-come, first-served basis. Tickets will be distributed one hour before the screening time. 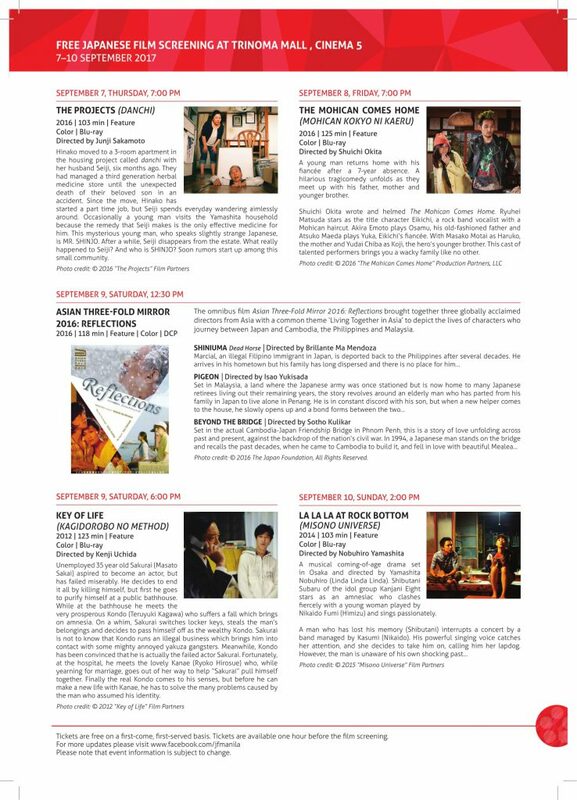 Please see below promotion material for more information on the screening schedules and film details. The Festival will also culminate in a Public Event at the Trinoma Mall Activity Center on September 9, 2:45 to 5:30 pm, with a performance by Airdance Philippines (with Rhosam V. Prudenciado Jr. of Dance Dance Asia 2017, also an event by the Japan Foundation Asia Center). This will be followed by a mini-concert with Rivermaya, Julie Anne San Jose and Erik Santos, together with Japan’s Soil & Pimp Sessions and Pink Cres. 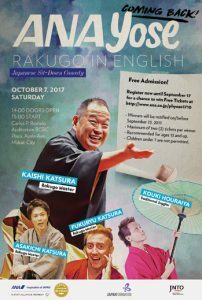 Organized by All Nippon Airways (ANA) and in cooperation with The Japan Foundation, Manila (JFM) and Japan National Tourism Organization (JNTO), we bring back Rakugo in English, a Japanese Sit-down Comedy with special Japanese guest artists to enthrall Philippine audiences on October 7, 2017, Saturday, 3:00pm at Carlos P. Romulo Auditorium, RCBC Plaza, Makati City. Rakugo is a Japanese comic storytelling art that has been used as entertainment for over 400 years and is still widely popular today, staged at “yose”, which are specialized theatres for Rakugo. The artist speaks to the imagination, and single-handedly creates the hilarious side of tradition of Japan. Enjoy Rakugo with Kaishi Katsura, the world’s top performer of English Rakugo and former Japan cultural envoy, along with Asakichi Katsura and Fukuryu Katsura. Meanwhile, as a colorful counterpoint to all-talk comedy, Kouki Houraiya will amaze audiences with daikagura traditional clowning, a vintage street art with elements of acrobatics, juggling, magic, dance, and comedy. Get a chance to win free tickets to this one-of-a-kind Japanese comedy show: Register now at http://ana.co.jp/phyose1710. Registration is open until September 17, 2017. Ticket winners will win on a lottery basis, with maximum of two (2) tickets per winner and will be notified through e-mail on or before September 23, 2017. The Japan Foundation was established in 1972 by special legislation in the Japanese Diet and became an Independent Administrative Institution in October 2003. The mission of the Japan Foundation is to promote international cultural exchange and mutual understanding between Japan and other countries. As the18th overseas office, the Japan Foundation, Manila was founded in 1996, active in three focused areas: Arts and Culture; Japanese Studies and Intellectual Exchange; Japanese-Language Education Overseas. For more information please visit our website at www.jfmo.org. 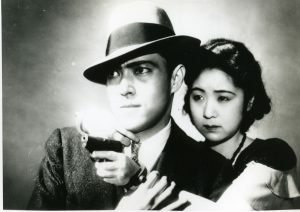 The Japan Foundation, Manila proudly brings a rare performance by Japanese renowned benshi, or silent film narrator Ichiro Kataoka, accompanying Yasujiro Ozu’s silent gangster film DRAGNET GIRL (非常線の女 | Hijyosen no onna, 1933) on Saturday, September 2, at 5:30pm during the 11th International Silent Film Festival Manila held at Shangri-La Cineplex, Shangri-La Plaza from Thursday, August 31 to Sunday, September 3. Throughout the world, silent films were shown with musical accompaniment. However, the silent films screened in Japan from the turn of the century to the mid-1930s were not only accompanied by live music but also a performer, known as a katsudo benshi (活動弁士) or benshi (弁士) for short, delivering live performance acting as a narrator, actor and storyteller. Standing next to the screen, benshi provides everything an audience may need to fully appreciate and enjoy a silent film. Some of the benshis were stars and had their own followers, making them more popular than the movie itself at the time.With the coming of sound film, benshi disappeared but a small number of benshi continued to perform along with silent film screenings, keeping this unique tradition and art of narration alive. Ichiro Kataoka is one of the best-known active professional benshi in Japan today. He has been narrating more than 350 silent films not only in Japan but internationally, having been invited to perform at festivals and special screenings around the world including Australia, Belgium, Canada, China, Croatia, France, Germany, Italy, Poland, Sweden and United States. A star student of master benshi Midori Sawato, he is also a film and television performer, a voice actor for animation and video games. This is his first time to perform in the Philippines. Accompanying the silent film and benshi is the Celso Espejo Rondalla (CER), one of the Philippines’ world class string ensembles founded in 2002 by Maestro Celso Espejo, the group’s conductor and one of the pillars of the Philippine Rondalla. The CER is composed of three generations of outstanding rondalla players and have been invited to perform nationally and internationally. In 2012, the group represented the Philippines in the 3rd International Music Festival in Krasnoyarsk, Russia. A year after, the group performed at the 65th Anniversary of the Embassy of the Philippines in Rome, Italy, the India International Center Experience: Festival of The Arts in New Delhi India (2013) and the 50th Anniversary of Diplomatic Relations between Iran and the Philippines in Tehran. Yasujiro Ozu’s gangster film DRAGNET GIRL, which Kataoka will narrate, is considered as one of Japanese cinema’s masterpieces; and ​is ​about a body guard committing robbery to help a subordinate in trouble and plans to make a getaway, but is confronted by his lover, a typist who by night inhibits the world of the yakuza. Kataoka will narrate the film in Japanese, and there will be subtitle of his narration in English. The movie will be presented in a rare 35mm and lasts 100 minutes. EIGASAI Celebrates its 20th Anniversary with 20 Films! *Davao screenings have been postponed. Download simple printable screening schedules here. 9-Jul Sun 1:30 WHAT A WONDERFUL FAMILY! 4:30 WHAT A WONDERFUL FAMILY! 5:30 WHAT A WONDERFUL FAMILY! 4:00 WHAT A WONDERFUL FAMILY! Tickets for Shang Cineplex screenings (except for July 14) are available for P100 each, seven (7) days prior to screening date. Screening at other festival venues (plus Thursday, July 14 screenings of Tagalized films at Shang Cineplex) are FREE on first come first serve basis. One ticket per person only. Manga Hokusai Manga introduces the similarities and differences between modern Japanese manga (comics), which now enjoys global popularity, and Hokusai manga. The exhibition begins with six images of Katsushika Hokusai (1760-1849), best known for the woodblock print titled The Great Wave, and ends with original works made by contemporary manga artists. Prior to its exhibition in the Philippines, it has been shown in countries such as Italy, Belgium, and Vietnam. The exhibition will feature a manga reading corner with the latest popular manga as well as classic manga from the Japan Foundation library. ​​Admission to the exhibition and events is FREE. Basic class open from ages 12 to above. Free materials will be provided. Limited seats available for the lectures and workshop so for reservations, please email aag@ateneo.edu. Manga Hokusai Manga is presented by The Japan Foundation, Manila, Ateneo Art Gallery, and The Embassy of Japan in the Philippines. Special thanks to our Media Partners ANIMAX and Otaku Asia. * Details are subject to change without prior notice. For updates,visit the Manga Hokusai Manga event page or follow Japan Foundation in Facebook. Research Center, co-curated by Patrick D. Flores (Vargas Museum) and Kyongfa Che (Museum of Contemporary Art Tokyo). This group exhibition is presented as part of the Japan Foundation Asia Center’s Condition Report, a collaborative art project with emerging young curators from Japan and Southeast Asia. Almost There began with a proposition, a fairly open one, but sufficiently pointed so that it could facet an angle from which to consider certain urgent concerns that the current world is facing as well as the complex history that had shaped it. The other impulse was to create opportunities for curatorial knowledge to be marked and conveyed across the generations. This aspect was sensitive to the process by which curation was demonstrated as a practice and in which emerging curators in the Philippines and Southeast Asia participated in carrying out the curatorial task along with peers who have had more exposure and experience in the field. The exhibition attempts to create resonance among a wide range of research, as well as of expressions of contemporary art from diverse parts of the world, including Africa and Latin America, areas with which the Philippine public has very scant acquaintance. In doing so, it attempts to open up a new scope of imagination and reflection to animate existing modes of knowledge, histories and subjectivities. That is, to find the potentiality of the political in this evershifting ambiguity. Almost There is supported by the University of the Philippines Office of the Chancellor and Department of Art Studies. Vargas Museum is located at the UP Campus, Diliman, Quezon City. The museum is open for viewing from Tuesday to Saturday, 9:00am – 5:00pm. For the latest updates about the exhibition, visit the Almost There Facebook event page (https://www.facebook.com/events/1817932108466477) or call the Vargas Museum at +63 (02) 928- 1927. TOKYO and MANILA (February 17, 2017) – The Japan Foundation Asia Center and the University of the Philippines Film Institute will be holding an Exchange Program for Film Students in Asia entitled …and Action! Asia #03 in the Philippines from February 26 to March 10, 2017, in cooperation with Ateneo de Manila University and De La SalleCollege of Saint Benilde. Nineteen film students from the Philippines, Japan, Indonesia, Thailand, and Malaysia will come together and co-produce short films within an eightday production schedule in Quezon City. The Japan Foundation Asia Center, a unit within the Japan Foundation dedicated to conduct and support collaborative initiatives in Asia, launched …and Action! Asia in fiscal year 2014 with the aim of encouraging a new generation of filmmakers from Asia to achieve a greater understanding of filmmaking in other countries, expand their networks in the region, and utilize their experience for their studies and future careers. For its third edition, the Program duration is extended, and held outside Japan for the first time. Thanks to the partnership with the University of the Philippines Film Institute, the students this year will collaborate in the Philippines, a country currently reveling in what is called the “third golden age of cinema,” bolstered by countless Philippine films enjoying critical acclaim and awards from various film festivals and competitions all over the world. Another first for the Program is the production and screening of the short films on March 8 from 2PM at Cine Adarna UP Film Institute, which is open to the public with free admission. As with the previous years, the Program will also have lectures by guest speakers including renowned film producer Bianca Balbuena, multi-awarded film director Carlitos Siguion Reyna and screenwriting guru Armando “Bing” Lao. The Program: … and Action! Asia #03 is generously supported by Sony Philippines. Organized by All Nippon Airways and in cooperation with the Japan Foundation, Manila, we bring you Rakugo in English, a Japanese Sit-down Comedy with special Japanese guest artists to enthrall Philippine audiences. Rakugo is a Japanese comic storytelling art that has been used as entertainment for over 400 years and is still widely popular today played at “yose”, specialized theatres for Rakugo. The artist speaks to the imagination, and single-handedly creates the hilarious side of tradition of Japan. Enjoy Rakugo with Kaishi Katsura, the world’s top performer of English Rakugo and current cultural ambassador for Japan, along with Asakichi Katsura. Meanwhile, as a colorful counterpoint to all-talk comedy, Utsumi Eika lends her versatile voice to comic song and story with shamisen music. Finally, Lucky Mai will amaze audiences with daikagura traditional clowning, a vintage street art with elements of acrobatics, juggling, magic, dance, and comedy. Regional live performances of Rakugo in English will also be held in Marco Polo, Davao City (Feb 20) and Ayala Cinema, Cebu City (Feb 22). With the motto of “Tradition and Innovation,” ONE ASIA Joint Concert is an international cultural exchange project formed around AUN J Classic Orchestra on November 28, 2016 at the Carlos P. Romulo Auditorium, RCBC Plaza. Admission is FREE but reservation is REQUIRED. The participating musicians with diverse national backgrounds spent four years together to develop mutual understanding of cultures and traditions, weaving the sounds of traditional Asian instruments into a fascinating harmony. In 2016, the project’s fourth year will see “ONE ASIA Classic Orchestra,” a symphonic orchestra composed of 32 players of traditional instruments from all 10 ASEAN member states and Japan, perform at Esplanade in Singapore for the expanded group’s world premiere.